Puerto Rico may be too rich to receive disaster relief help. It may sound like the beginning of a bad joke, but it’s the reality. According to the federal government, the hurricane devastated territory where most of the citizens are still without electricity has enough funds and doesn’t need more aid. This article will explain the reasons behind the federal government’s decision and how a Hurricane Maria Public Adjuster may help. Back in October, the Congress approved a $36.5 billion disaster relief plan to aid the states affected by a devastating hurricane season and address the destructive wildfires in California. However, the bill neglected Puerto Rico, giving it only a $4.9 billion loan, far less than states like Texas or Florida, for example. Moreover, it appears that the territory may be too rich to receive the loan after all. 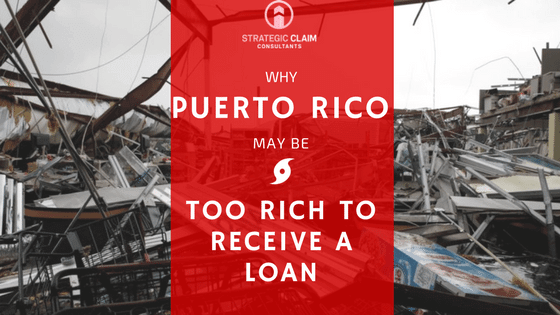 According to a recent letter from the Federal Emergency Management Agency (FEMA), the Congress won’t offer Puerto Rico the loan after discovering that the island had $1.7 billion of available cash on December 29, 2017. Since the purpose of the loan was to cover any gap in funding, FEMA concluded that Puerto Rico has enough cash and doesn’t need help. The U.S territory planned to use the money to increase its Medicaid program. According to Puerto Rican officials, the funds will run out at the beginning of this year without aid money. However, FEMA didn’t mention this problem in their address. What Can Puerto Ricans Do Next? Hurricane Maria was the most powerful storms to hit Puerto Rico since 1928. The devastation it produced and the toll it had on the Islanders were unimaginable. After months of living in poor conditions and being denied help, residents and businesses can ask the help of a Puerto Rico public adjuster and get the disaster relief they need and deserve. Go to Strategic Claim Consultants to learn more about the steps you need to take to receive professional help. This happens all too often. The Superintendent and administrators are paid large salaries along with other compensations that hardly any other person would ever recieve. They make sure new buildings, gyms and other facilities are built. Then they don”t have money to increase educators salaries or reduce class sizes. Frustrating.